At the price for which they are being offered, the Royal Enfield 650 cc twins have caused quite a lot of disruption in the entry-level performance motorcycling segment in India. India’s first homegrown and the most economical twin-cylinder motorcycles, these modern Royal Enfields are unlike anything the bike maker has ever made. Even with their stock, twin-exhaust setup, these machines sound rather interesting too, which also makes them the most characterful motorcycles you can buy at that price. However, if the audio from the stock pipes doesn’t float your boat, way2speed has developed a slip-on solution. Priced at INR 12,999, there are two variants on offer – One made of stainless steel 304 and the other from aircraft grade aluminium. At that price, you get a pair for each pipe and the sound is rather nice. The equipment amplifies the engine’s note by just the right amount, without making things too loud to crack the decibel meter. As of now, there is no information if these slip-ons also result in a bump in power, but they do contribute to some loss in weight. Combined, the standard pipes weigh 18 kilos. The slip-ons shave 5 kgs from that and bring the weight down to 13 kilos with the dB killers still attached. The aftermarket solution also shortens the length of the standard system, cutting it short just a little further than where the rear spring bolts itself on the swingarm. For more information or to order a pair for your bike, you may contact way2speed on Instagram. In other news, a scrambler version of the Royal Enfield Classic is about to be launched soon. 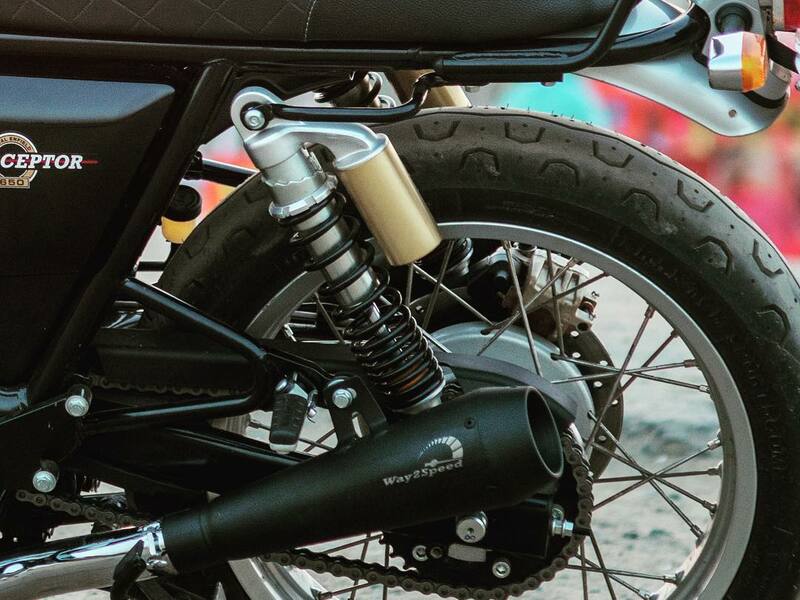 With the same propelling equipment as the standard Classic, the ‘Trials’ Royal Enfield will feature an upswept exhaust pipe, different looking fenders, trail-friendly tyres and some detailing in its bodywork. It won’t be a serious alternative to the Himalayan but should offer something more to potential RE Classic customer. We’ll bring you more updates on that as and when they arrive. Until then, stay tuned!